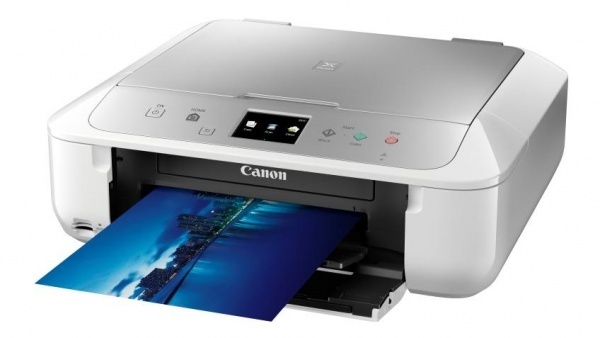 The impressive Canon Pixma MG6853 can print, scan, and copy. It offers a user-friendly interface and boasts high-quality resolution, making it ideal for photo printing. This high-performance printer is able to offer cost-effectiveness through its 5-ink cartridge system. Images will have better colour and users will only need to change the ink cartridge that has run out. Fax function is not offered, even as an option. The entire body of the Canon Pixma MG6853 is in white but its flatbed scanner and control panel is in silver. This model comes with a large touchscreen display and function buttons for quick operation. The front-load tray can handle 100 sheets at a time. Right beside it are the memory card readers. This impressive multifunction printer is well-connected and supports mobile and cloud printing. Users can directly print photos from their digital cameras or memory cards as the Canon Pixma MG6853 has WLAN PictrBridge and memory card readers. The maximum print resolution is 4800dpi and this unit uses 2pl FINE print head to ensure excellent and precise colours for photos and images. The Canon Pixma MG6853 is only ideal for home users, its print speed is decent at 15ipm for black and 9.7ipm for coloured. For paper-handling, optional trays are not offered as well as an automatic document feeder.